The Adriatic Throwdown 2017 is a competition brought to you by Fanatic Box CrossFit. 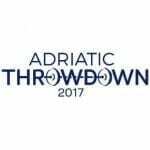 Adriatic Throwdown will take place in Umag, Croatia at Stella Maris Stadium from 2nd – 3rd of September 2017. In order to compete and demonstrate strength, endurance and overall fitness in Umag, each athlete will first have to qualify through the online competition. The online qualifiers will run from the 13th – 24th June 2017.